Mark Saltveit displays for the first (and last?) time the World Palindrome Championship trophy. A master palindromist (and stand-up comedian), Mark Saltveit ’83, of Portland, Oregon, moves backward as well as forward in life more than most of us. Constant readers will recognize him as the author of “No Smircog!,” a 1997 “interview” in this very space with Professor Osseforp about a Harvard-Yale football game, a piece full of “Eli bile.” Now we learn that he has won the first World Palindrome Championship. Saltveit defeated two professors, two computer programmers, a cartoonist, and a book clerk to win the championship contest, hosted by Will Shortz, The New York Times crossword-puzzle editor. According to the championship’s official news release: “600 word nerds filled the ballroom at the Marriott Hotel at the Brooklyn Bridge and watched seven prominent palindromists deliver new reversible verses written on the spot. Audience members voted by deploying signs that said “WOW” on one side (for their favorite) and “HUH?” on the other. The seven finalists had 75 minutes to construct palindromes fitting any one of three constraints: use an X and a Z in your palindrome; write about someone prominent in the news in the past 12 months; or about the competition itself. 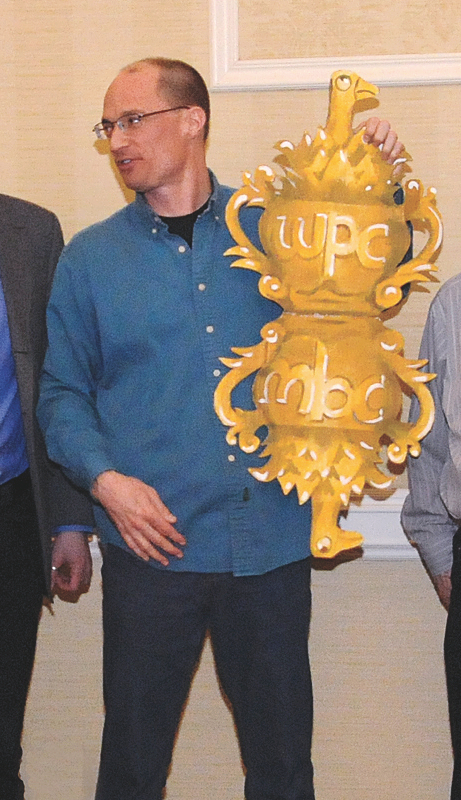 The trophy for the first-ever contest was made, Saltveit reports, by “artist and finalist Jon Agee out of cardboard. It is flat and was scored on the back and folded together, so that it looked like a regular trophy (i.e., the top half of what you see in the photograph).” At the triumphal moment, when a trumpet blared, Saltveit dropped the back half, and it unfolded into a symmetrical trophy. Cory fixed that with Conundrum (Cory Publishing, 2012), the first in a planned series featuring Cambridge architect Iris Reid as an amateur sleuth. Here she tries to catch a murderer at her twentieth GSD reunion. Good luck to her; all the incriminating evidence points to Iris herself.